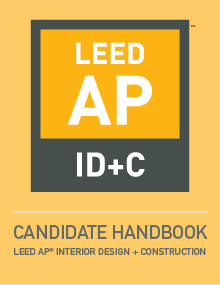 The LEED AP ID+C Candidate Handbook represents current policies and procedures for a LEED v4 ID+C professional credentialing exam. The LEED AP ID+C Candidate Handbook represents current policies and procedures for a LEED v4 ID+C professional credentialing exam. Includes exam specifications.